Is your home undergoing repairs because of a fire or flood? Whether you’re completing small renovations or completely restoring your space after a damage incident, your family will need a liveable and functional place to stay. If you don’t have relatives in town, or there’s not enough room for your whole family, you may want to consider living in an extended-stay hotel. 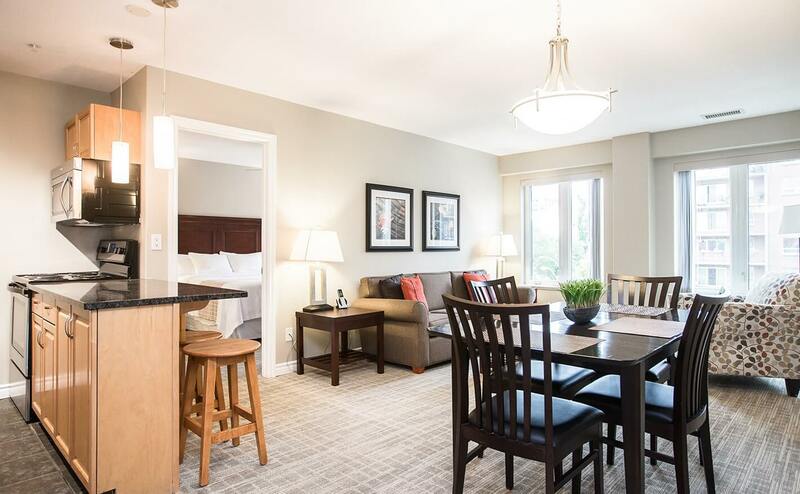 Canterra Suites Hotel is a downtown Edmonton extended-stay hotel, where you can rent long-term suites with up to three spacious bedrooms, full kitchens and in-suite laundry—everything you need to feel at home. So, relax while you rebuild your home. Here are three reasons why Canterra is your best choice for long-term stays. If you’ve been displaced, the last thing you need is to be in a hotel where you don’t feel completely comfortable and at ease. We want our family suites to be your escape from all the hassle of renovating your house after an unexpected incident. That’s why your suite will have a fully functional kitchen, equipped with appliances, utensils, dinnerware and cookware—everything you’ll need to prepare family meals. Canterra is also a pet-friendly hotel so you can bring your furry family members along with you. When you stay at Cantera, you’ll be right in the heart of downtown Edmonton. Enjoy the convenience of being just steps away from the best local shops and restaurants. Anything and everything you need is within walking distance. If you prefer to drive around the city, we also offer free outdoor parking. Or, you can take advantage of Edmonton’s fast public transportation system and just leave your car safely parked. If you’re staying at Canterra because your home needs to be restored after fire or water damage, you don’t have to worry about the hassle of dealing with your home insurance company when paying for your additional living expenses. Canterra offers direct billing to your home insurance, so you can focus more on recovering and rebuilding your home. Whether you need a place to stay for a few weeks or several months, Canterra Suites Hotel in downtown Edmonton specializes in both short- and long-term stays. If you have any questions about direct billing for your additional living expense coverage, give us a call at 780 421 1212 or email us at info@canterrasuites.com.